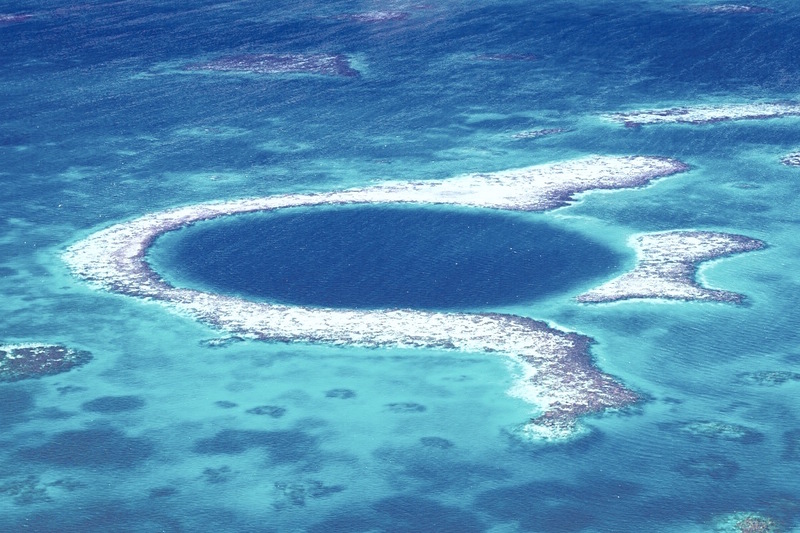 The Great Blue Hole is a submarine sinkhole off the coast of Belize. Four hundred feet deep and a thousand feet across, this wonder of nature is a journey through a cathedral of stalactites and stalagmites to a dark, watery depth. So just how did The Great Blue Hole happen? Turns out that cavern was formed on land during the last ice age, tens of thousands of years ago. It started as a limestone cave that sunk when the ground collapsed and a giant circular hole formed –– which was then filled by the rising Caribbean Sea. Made famous by renowned marine biologist, Jacques Cousteau, in the 1970s, the Great Blue Hole is a popular destination for divers the world over. Located in the middle of an atoll (a ring-shaped reef, island, or chain of islands made of coral) off the coast of Belize in Central America, the Great Blue Hole is a protected World Heritage site. With the stunning contrast of dark against light, shallow against deep, nature has once again provided a masterpiece of nature, a true gem in the middle of the sea.